Hello everyone! 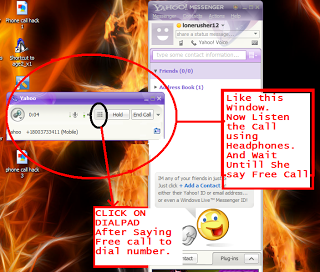 Today I will give you a full proof hack for calling from a PC to mobile phone without spending a single penny. This is 100% tested and successful. All of the phone calling hacks provided up until now are no longer working. I have been personally using this hack successfully for more than 15 days, with 100% success. 1. 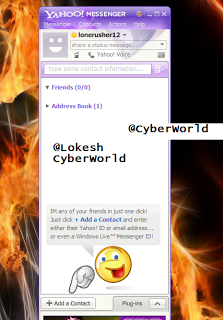 Download the latest Yahoo Messenger or Skype. 2. 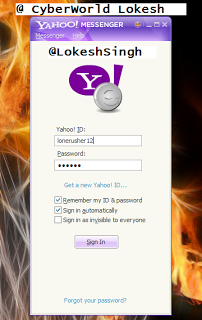 Install Yahoo Messenger and log in to your Yahoo account. 3. Type the following number 18003733411 into the red box shown below and press enter. 4. 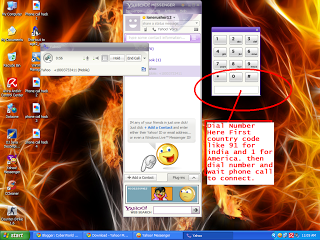 After pressing enter, a small window will open showing that the messenger service is connecting a call to that number, as shown below. 7. After saying “free calls,” you will be able to make a free five-minute phone call anywhere in the world. 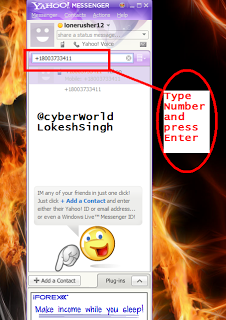 Now click on the dial pad, as shown below, to dial the number. 9. Dial the phone number. Don’t forget to use the correct country code while calling. For example, 919457196088 where 91 is the country code for India and 9457196088 is the phone number. After dialing, wait 2 seconds for the phone call to connect. After that, you can talk for up to 5 minutes. This was the full tutorial, with screenshots included. 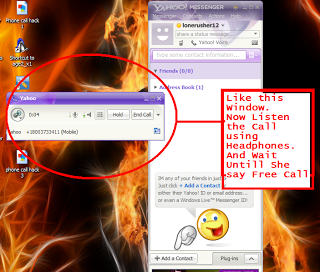 It was recently discovered that this works perfectly with Skype and other free services. Credit for discovering this goes to our Sir Mohd Qadeer. For Skype, follow the same procedure. 2. Sign up for an account on Skype. 3. Now Add 18003733411 to your Contacts. 4. Click on the “call” button that will appear on the number from step 3. 5. Now listen to the call carefully. When the voice says “free calls” you need to repeat that phrase. When the voice says to type in your country code, type the country code you need, dial the number, and you will be connected. That’s an overview of the procedure. Sometimes it may tell you that all lines are busy. Don’t panic, just wait a few minutes and try again. If you have any problems, leave a comment below. the steps are not the same on skype.. She said “Business, Government or Residentiontial” i choosen Residential.. then i dont understand what she is saying.. help me please..